Thomas Smith made his fortune running the Union Porcelain Company. He spent it - or some of it at least - on this house. He also left behind a mystery. 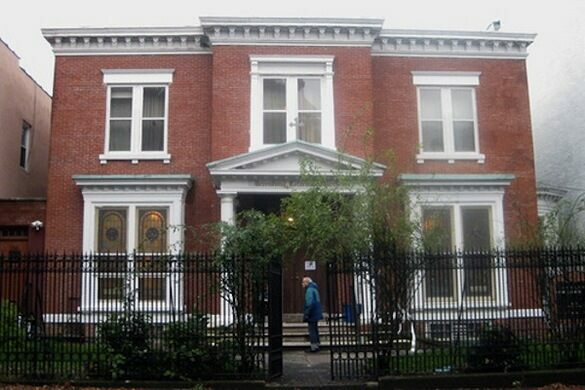 The only remaining Jewish congregation in Greenpoint. A 9-story, poured concrete structure which was used as a glue factory with an indelible smell. Where Greenpoint's first European settler—and troublemaker—made his home. Born in Long Island, in 1815, Thomas Smith’s father died when he was six, and at sixteen Smith moved to New York to work as an apprentice to a master builder. After the Civil War, having invested heavily in a small porcelain factory in Greenpoint, Brooklyn, Smith took over the abandoned and dismantled company as a partial satisfaction of debt. After about two years of experimenting with various types of porcelain, Smith put his “hard” porcelain on the market. Beginning with doorknobs, caster wheels, insulators and moving onto fancier fare such as as Vases and Platters, today the Union Porcelain objects are quite valuable and some items now reside in the Metropolitan Museum. 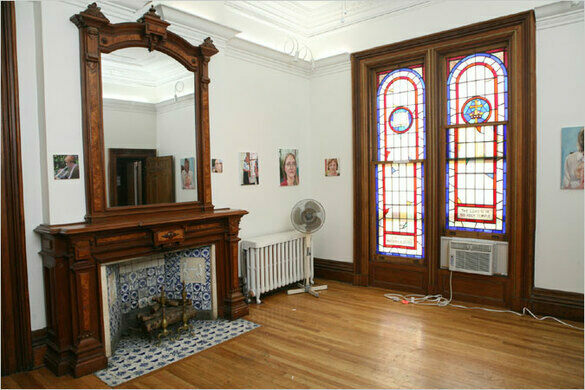 Smith died in 1901, and the home briefly became the Greenpoint YMCA before the congregation of the Greenpoint Reformed Church purchased the property in 1944. 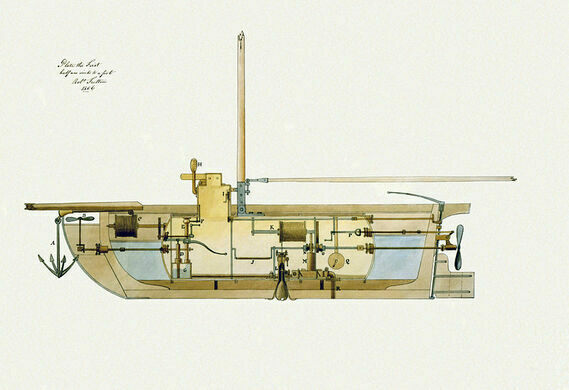 But Smith had left a few hidden mysteries still to be discovered. Over the years as the basement floor was worn down, doorknobs, and broken ceramics began revealing themselves. Apparently, ever money conscious, Smith had used his companies ceramic scraps to mix in with the concrete. Even more surprising was the tile found in 2008. Accidentally stumbled upon by the director of the historic preservation program at Columbia University, was a strange tile in the back wall of the parlor fireplace. Realizing it was strange and unique a team of experts was assembled to examine it. 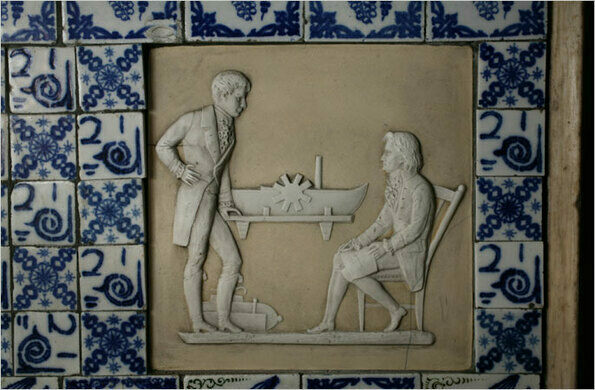 The tile is believed to be a portrait of Robert Fulton, designer of the “Nautilus,” the first practical submarine (made on behalf of Napolean Bonaparte no less) and of Robert Livingston, Fulton’s business partner. The tile was likely made in the 1870s, but remains unclear if Smith knew Fulton, whether he commissioned the tile, or as with his basement, he just had it lying around. Today the Greenpoint Reformed Church - in addition to its religious devotions and services - hosts meetings of community groups, offers the services of a soup kitchen to those in need, and has found itself utilized as a set piece in several films and television shows. Ornate "Renaissance Revival" style building. 1800 rooms of single-family residence in Brunei.